As many of you may be aware (if you watch my daily Facebook livestreams), I’m down at our farm in Florida for the winter. We’ve been here two weeks and already it feels as if I never left. When you have a remote residence and you leave for a while, returning is not as simple as walking in the door and unpacking your bag. This year, we are fortunate enough to have Sam Van Fleet with us. She’s one of Cat’s best friends…well, no. Make that she IS Cat’s best friend. 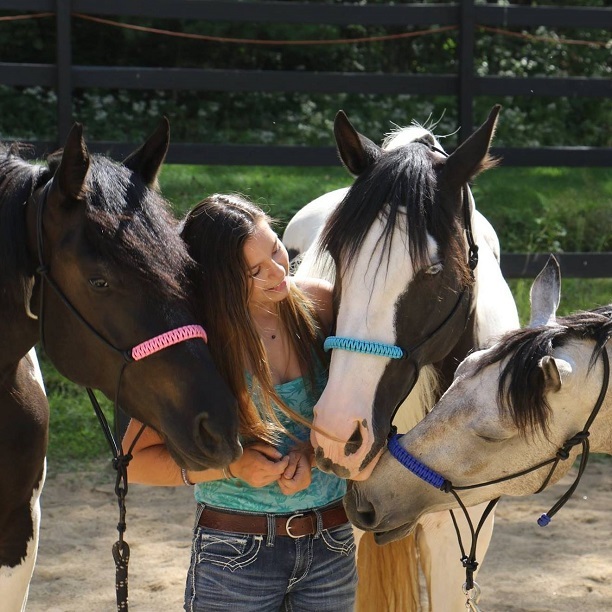 They met through the Extreme Mustang Makeover in 2015 and have been like two peas in a pod ever since. When Sam wanted to join us for a gap year in Florida, I was excited. While I like to think of myself as great company (ha ha), I know Cat gets bored of me so having a friend with us for the winter is awesome. And, like Cat, with Sam comes horses. Last year, I did a livestream about building a barn on the property. Yes, we already have one. But one of the (terrible) tenants we had in the past started a structure. In reality, it was six posts and one half wall. That’s it. Our first project was to build the barn so that Sam and her BIG horses could have their own space. I know Cat loves managing her own barn. I figured Sam would like having her own, too. Plus, it was motivation to get the barn done. We started working on it on Wednesday, October 17th and finished on Saturday, October 28th. Let me tell you, those were the LONGEST eleven days of my recent life. Every muscle and bone in my body was killing me. And I was sooooo tired of driving to the lumber yard. Every day I went…and I was always thinking that THIS was the last trip (wrong). There’s a lot of work that goes into building a barn, especially when you arrive at the farm to realize that you have new tenants—unwanted tenants. FOUR LEGGED tenants. I definitely cried once or twice while trying to clean up the destruction left behind by our new tenants. Fortunately, I brought five cats and four dogs with us so the mice population has quickly simmered away in the house. Instead of three or four killed each day, we’re down to one or two a week. The barn, however, is a different story. Poor Cat (my daughter, not a feline) is battling major mice issues. Interestingly enough, the house mice are small and the barn mice are big. Not rats but bigger mice. I never realized that there are so many types, shapes, and sizes of rodents! Almost every day we are finding families of mice “sleeping” in the horses’ water buckets. I hear Cat scream and, with a sigh, I shut my laptop and wander outside to dispose of their little wet bodies. At night, I often think about the Amish. I wish my house was as clean as the Amish keep theirs. Maybe then I wouldn’t have mice. But with four dogs, five cats, four pet rats, and three parrots, a clean house is found only in my dreams. L I wish my barn was as orderly as the Amish keep theirs. Unfortunately, the temperate climate and dust make that impossible. Between mice, lizards, GINORMOUS spiders with yellow things on their butts, and palmetto bugs, a clean barn won’t happen either. But I do like living off the grid a bit. Sure, we have electricity and (sometimes) heat. Our farm is so remote and secluded that it’s a welcome change from Morristown. It’s quiet. I like the quiet. The people are so nice. I like nice people. And, overall, it’s just a happier place. In my mind, I know it’s probably as Amish as I’ll get. But I’ll take it…mice, spiders, bugs and all. Also in the country, you will find snakes so be aware. My son lives in Morriston in Levy County and they find snakes periodically. Usually one of their dogs barks alerting them to the presence of one. Glad you got the barn done. You can always find projects to do when you live in the country. Don’t tackle too many at once. Leave time for relaxation and writing. I loved your story. Reading about your family adventures is like reading one of your books! Keep the stories coming?